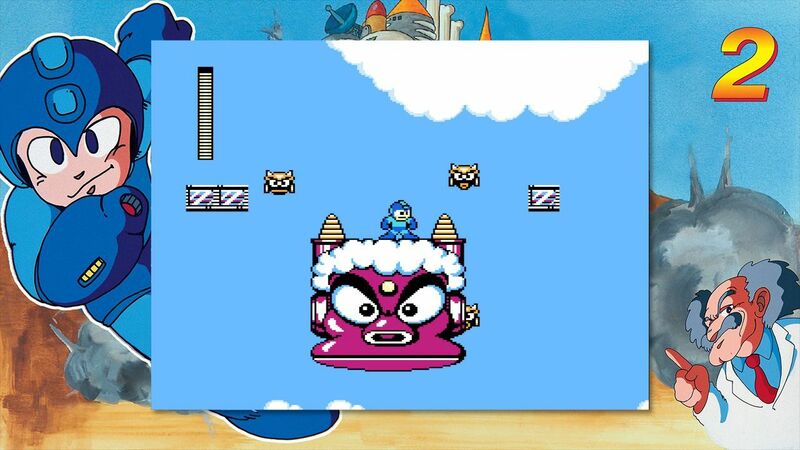 Nintendo Switch owners may still be pining for classic Virtual Console support, but even though the retro-flavored service still doesn't appear to be in Nintendo's grand strategy, the old-school charm lives on in new Switch releases like the Mega Man Legacy Collections one and two. More than a way for modern gamers to revisit a set of classic titles from the series' past, these new collections are the latest and most feature-packed way of enjoying the games centered around the traditional Mega Man formula. At this point in time, the original Mega Man is over thirty years old, and even though the Mega Man Legacy Collections one and two are both brand-spanking-new, the games themselves clearly hearken back to a different era of electronic entertainment. The first Legacy Collection groups together Mega Man releases one through six, encompassing the entirety of the original NES series. On the other hand, Legacy Collection 2 groups together Mega Man 7 from the SNES, Mega Man 8 from the original PlayStation, Mega Man 9 from the PlayStation 3 and Wii era, plus Mega Man 10, which originally released for Wiiware, the PlayStation Network, and Xbox Live Arcade in March of 2010. For the uninitiated, the Mega Man series focuses around the story of the android known as Mega Man as he attempts to rid the world of the evil robotic influence spread by Dr. Wily. His adventures take on the form of classic two-dimensional sidescrolling platforming action, with overall presentation and difficulty varying wildly from one release to the next. Fans of the series will feel right at home with these classic releases, occasional bouts of slowdown and all, but players new to the series may be in for a bit of a shock when they discover just how challenging these games are. The primary draw to the first Mega Man Legacy Collection is the title's new Rewind feature. Using the left bumper, players can rewind the game and fix any mistakes they may have made during their current run. In effect, this means players can get infinite retries on any enemy encounters, difficult platforming areas, or boss battles. 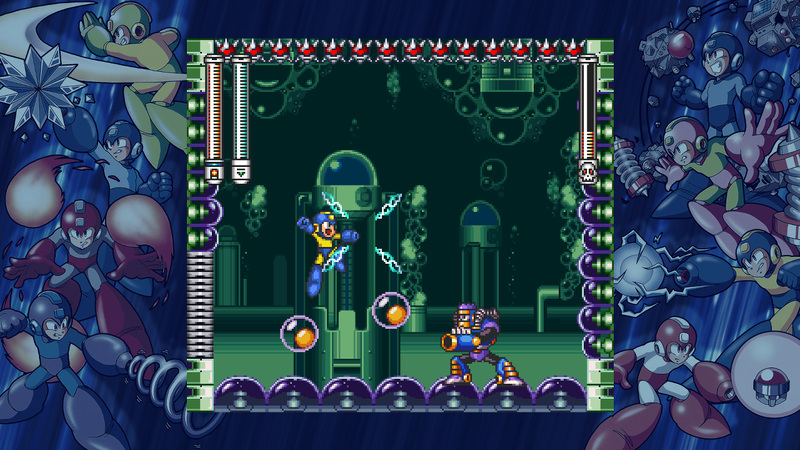 The feature is meant to help the experience feel more approachable for newcomers who might not be prepared for just how challenging Mega Man games can be, but its implementation goes well beyond a quick fix for casual blunders. Given enough time using it, the rewind mechanic feels less like a helpful tool and more like something that was meant to be a core part of the gameplay. In fact, especially in the earlier Mega Man titles, the rewind becomes so useful that players might be left wondering how the games could ever be beaten without it. In a way, knowing that it's always available dramatically changes the general strategy: without the need to remember enemy locations or room layouts from previous runs, players can take a more action-oriented approach, learning from their mistakes and correcting them on the fly. As the developers intended, this function does make the 8-bit Mega Man titles more approachable to casual players. There's a lot less pressure knowing that each level won't have to be restarted because of an ill-timed jump or frustrating "ledge bat" type enemies, and Mega Man purists can ignore the function entirely if they so choose. Either way, the rewind does make for quicker runs overall, and more experienced fans should have no problem using the rewind to beat some of the featured games in 90 minutes or less. 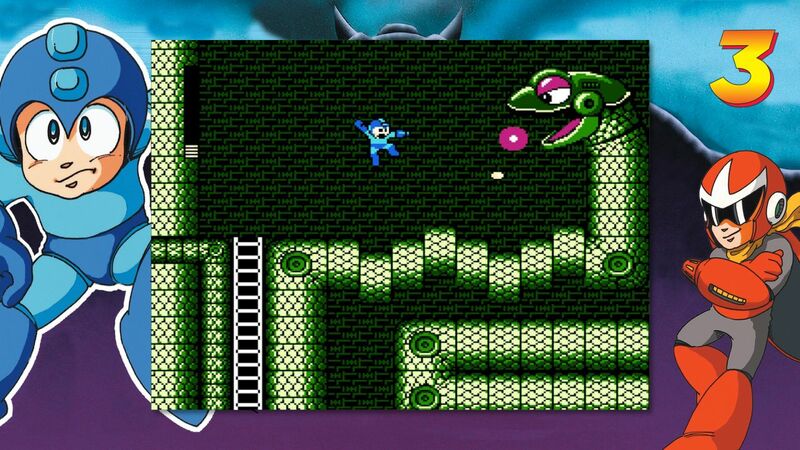 Fans won't find the Rewind function making its way into Mega Man Legacy Collection 2. Its omission isn't a point of contention, however — the newer games are certainly challenging, but they aren't as brutally hard as games in the original series were. Of course, that's not to say that the development team hasn't included any extra goodies. The biggest change introduced in Legacy Collection 2 that's meant to make the games more approachable is the choice to make use of the added Extra Armor Mode, a toggle in the game's general options menu that essentially makes the experience less punishing by allowing the stoic blue hero to take more damage before perishing. On top of that, the game now includes several additional checkpoints so players won't ever be too far from where they last died — no more restarting entire levels just because of one missed jump. The cherry on top of both Mega Man Legacy Collections is the suite of various bonus features. In the game menus, players will find art galleries, time trials, a music player, a character and enemy museum, stage remixes, and more. Within the games themselves, bringing up the pause menu also offers up options to change the video size, frame borders, and even a selection of different video filters like scanlines or CRT-based filters that help the games feel like they're being played on original equipment. The presentation overall is very slick, with simple menus and a general theme that fits in very well with the series' history. Most games also offer their own independent save states — in the first six games, players can literally save and load at will, returning to any place in the game they so choose. 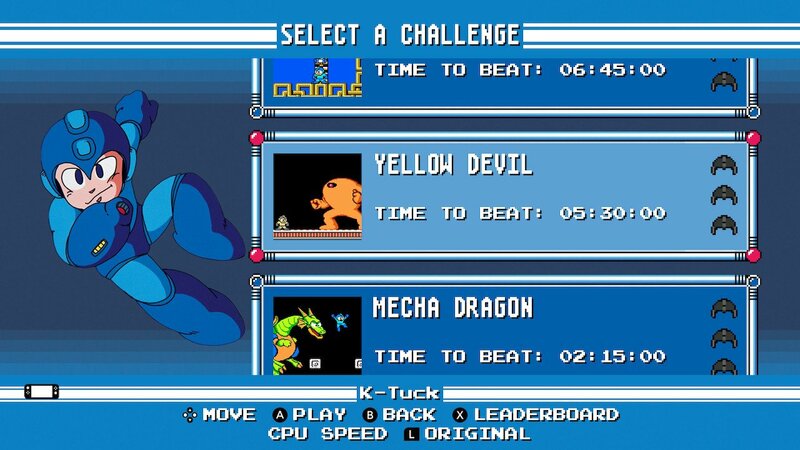 Of course, players can always make use of the original password save systems if they so choose, and taking screenshots or video clips on the Nintendo Switch makes it easy to share accomplishments or even game progress with other players. All things considered, the inherent value of Mega Man Legacy Collections one and two can only be determined by specific player interest. These collections might be nice and new, but the experiences within are distinctly old-school, providing the sort of gritty, challenging platforming action that feels increasingly rare in the current era of gaming. It may be that all the added bells and whistles won't be enough to bring modern gamers around to the traditional Mega Man formula, but for series fans keen on diving back into the classic releases, both Mega Man Legacy Collections are an absolute treat. This review is based on download codes provided by the publisher. Mega Man Legacy Collections 1 and 2 are available in digital stores on May 22 for $14.99 and $19.99, respectively. The games have been rated E for Everyone by the ESRB.